Sharing a Jewish Holiday Story and Rituals and some Parenting tips. Fun and loving holiday rituals increase emotional fitness aka Emotional Intelligence. 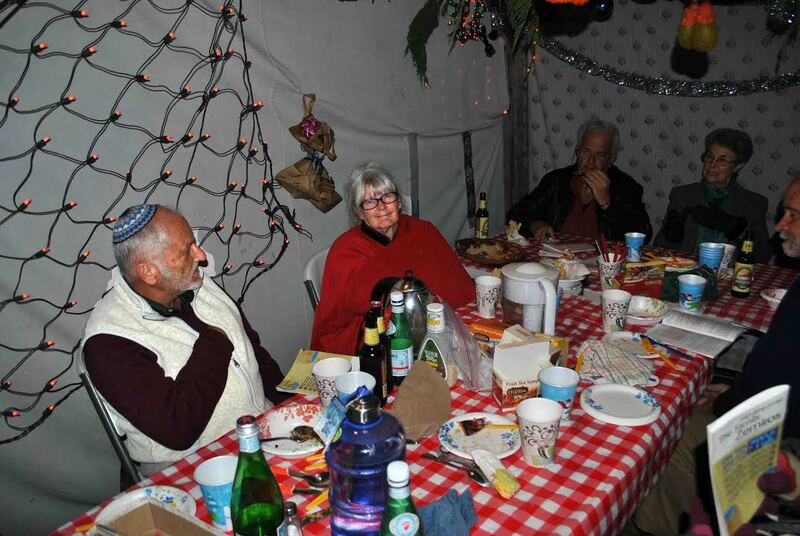 We celebrate Sukkah with our Aish friends Barry and Tsivya Frieder. Read on to hear her amusing and thoughtful tale about setting up their Sukkah. The first year we had this sukkah we had four canvas walls.The second year we had three canvas walls.Now we have two canvas walls, two blankets and a couple of sheets.How could we possibly misplace two large pieces of canvas? I stepped out of my house and found a hill of skach practically sitting in my front yard. On the precise day I decided to bite the bullet and deal with skach, my next door neighbor decided to cut down his bushes, the very bushes that had been sitting there unmolested for several decades. Not only that, but when he found out what I was up to after I was able to speak coherently, he helped me lug the sweet, piney branches down to the sukkah. But it doesn’t end there. Little miracles occurred all day long. Instead of dropping wgat I was doing and running out to buy more heavy duty staples, I decided to use the few I had to hang up the walls and see how far I got. And, unbelievably, the last staple I had was the last staple I needed to put up the walls! Unexpectedly, a close friend of ours who removes tree stumps was able to come racing over and remove the offending branch that was looming over the sukkah, rendering it kosher again.He also fixed the problem of the separating beams and then raced off again. HaShem may be hidden in the world, but at times He’s not very hidden. And there was more. My plans for being in the eruv were just not working out for Sukkot yom tov. Although I had begun working on pulling things together weeks before, I found myself having to change neighborhoods just days before the holiday started. I had a choice: I could grump about the situation or I could choose to believe that HaShem wanted me on the East Side for some reason. He had some surprises in store for me and I could borch or I could find the gifts. I decided to do both. I grumped for a while and then put a cheery face on things. Then grumped some more. Then waxed philosophical. And all the while I was wondering why does HaShem want me on the other side of town? In short order, it became obvious that the process of seeking out hospitality was putting me in touch with an entire community that I had very little to do with. I realized with a shock:I have grown comfortable and complacent, stuck in a rut! My passion is building community, and here is large community I’m mostly out of touch with! And what an open-hearted community it is! The people I reached out to had suggestions and invitations, and some took time out from their hectic pre-yom tov schedules to have long conversations with me and hosts, going over options and brainstorming possibilities. In the end we had so many invitations from this very hospitable community—from old friends, people I had known for years but hadn’t visited before, and people I had not met yet—that we ended up hopping from one sukkah to the next, and still ran out of time before we had visited everyone. We heard new devar torahs, participated in Torah discussions that were radically different from the crowd we normally hung out with, and played with totally adorable children and babies (one of whom nibbled her way down the challah I was holding for her and took a bite out of my finger). Who ever thought that the dreaded Plan B could result in what felt like a three-day party? Hmmm. Our sages tell us that we can’t know the reasons HaShem causes things to happen. However, we can catch glimpses of some of the effects. One effect is the possibility that the next time my plans are not working out the way Iwant, I might remember to trust that HaShem knows exactly what He’s doing! Just a thought…. Religion gives children a start in learning right from wrong. Rituals are fun ways to build a child’s understanding of his or her religion as well as to build a good memory book. Both are important Emotional Fitness Tools. Setting up a Creche is a Christian family rite. Decorating the Sukkah a Jewish family rite. The more we understand about each other’s religion the more we can create Peace on Earth. Tip one: Whatever your religion, spiritual, or philosphical beliefs, and the younger your child, the more s/he needs to have rituals and stories that teach him right from wrong. The more s/he can take part in the ritual in a fun way, the better. Tip two: Make sure the rituals are fun. The younger the child, the more important this is. Tip three: As you child grows in greater understanding expect questioning. Being too dogmatic or fanatic may drive him or her away. Better than arguing is remembering no one does religion exactly the same way. Pope Francis is not Pope John; The current Dalai Lama is not the last Dalai Lama, Hillel is not Akiba. This allows you to take a critical view of your religion’s negative teachings and disavow what is not kind. Being kind and caring is what all religions agree on. Where they disagree is who that applies to and how to treat those outside of the tribe, family, or religion. Go to the EFTI store and browse its offerings for inspirational quotes or exercises. Subscribe to be notified of new additions. This entry was posted in Parenting Issues and tagged Emotional fitness, help for parents, how to parent, Humor, Katherine Gordy Levine, Life, parenting, parenting tips, parents, Parents Are People Too, postaday, Religion, teens. Bookmark the permalink.